Boasting four rivers, hundreds of miles of undeveloped coastline, a national wildlife refuge and portions of a national forest, Wakulla County offers countless opportunities for birding, boating, biking, hiking, kayaking and wildlife viewing — making it a nature buff’s paradise. Wakulla, Gilman notes, attracts its share of domestic and even international visitors, with the bulk coming from Kentucky, Tennessee, Georgia, Alabama and Louisiana. Growth in tourism is reflected in steady year-to-year increases in revenue generated by the county’s 4-cent bed tax. As for visitors’ home countries, “They range from Argentina to Zimbabwe,” said Amy Conyers, the manager at Ed Ball Wakulla Springs State Park, one of the county’s biggest visitor draws. Lesser known places, however, rely on a more localized market, according to Cynthia Paulson, founder of Palmetto Expeditions, a 10-year-old enterprise that connects clients to independent guides and outfitters and also arranges customized group tours for businesses, schools and organizations. From a tourism standpoint, she sees both positives and negatives to Wakulla’s naturalness. Marie-Anne Luber agrees. A green-certified river/hiking guide, her clients range from young couples to families with children to foreign visitors and exchange students. Fortunately, the county’s outdoor recreation possibilities are plentiful. “It’s amazing how much water there is around here,” Luber said. All of that water, combined with miles and miles of undeveloped waterfront, makes for some outstanding fishing. There was a time, decades ago, when the Shell Island Fish Camp, located on the Wakulla River near its mouth in St. Marks, attracted large numbers of duck hunters. But that bird has flown. Now, the camp is all about fishing, and the growing popularity of inshore angling — a product of the expense and the limited seasons/bag limits associated with offshore trips — has served owners Sherie and Jimmy Bevis and their employees well. Shell Island “campers” fish year-round, but spring and fall fishing tends to be best, according to camp employee Bucky Odom. “And, if we don’t get a lot of rain in the fall (meaning that salinity levels remain high), the trout will bunch up in the rivers in the winter,” Odom pointed out, a condition that can make for some fast action for anglers who slow down their lure presentations in the cold water. The camp, which has been expanded several times through the years, was established in the 1950s and has been in the same family since 1962, Odom said. Many, if not most, other fish camps have closed. From time to time, the camp entertains international guests who spend time in Orlando and then go exploring. The camp’s accommodations run from $68 to $96 a night and include cabins, motel rooms and “park models,” trailers that resemble stand-alone cottages. If you are looking to reserve a cabin on a weekend when the weather is cool, you may need to call months in advance. The camp has boats for rent, provides dry storage, repairs engines and will even clean your catch. Odom is a fisherman himself, and he’s a MirrOlure man. If limited to four lures, he said, he would carry three MirroLure products: Top Dog, Mirrodine and Catch 2000 hard-plastic plugs. And, he would grab a bag of Berkley “Gulp” Jerk Shads. Rob Baker has been around non-motorized watercraft all of his life. His grandmother founded TnT Hideaway Canoe Rental in Crawfordville long before Baker could handle a paddle. Baker was hanging around TnT and helping out with the business when kayak fishing began to catch on in the mid-1990s. Today, kayaks are his specialty. 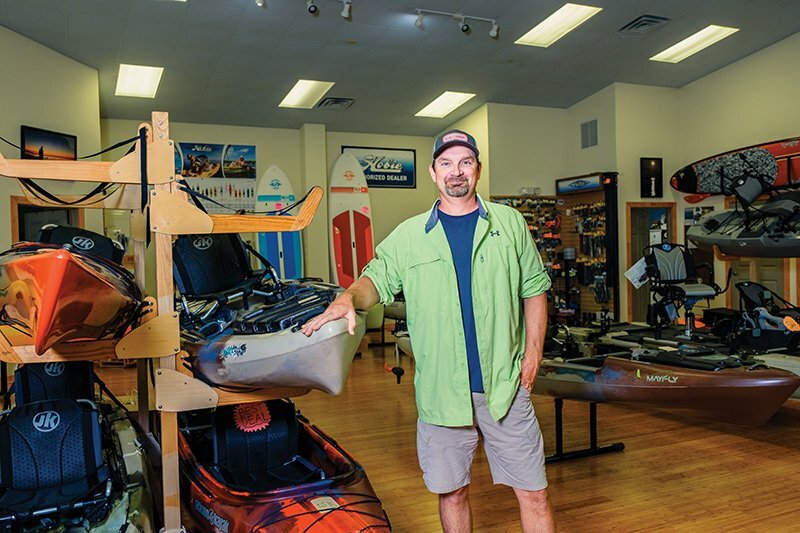 His shop, The Wilderness Way, located in Crawfordville, sells leading-brand kayaks — Hobie, Jackson, Bonafide — and he leads kayak fishing trips out of St. Marks. Most trips commence at first light and last four hours. Typical targets are redfish, speckled trout and flounder, but anglers also tie into tarpon, cobia, tripletail and Spanish mackerel. “We’re also beginning to see some snook,” Baker said, referring to a sportfish usually associated with South Florida. Snook, it seems, are expanding their range in response to rising Gulf water temperatures. Baker prefers to use artificial lures, in part because they result in fewer gut-hooked fish and also because he likes to do more than wait for a float to go under. His arsenal includes topwater plugs, jigs and spoons, and he is especially high on a plug called the Stick Shadd, manufactured by Sebile Tackle. All kayaks are of the sit-on-top variety and are pedal-driven. Hands-free propulsion is a real advantage when casting, reeling and, one hopes, landing fish. Anglers who like to land trophies and prizes will find competitions in Wakulla County, including the annual fundraising Rock the Dock tournament, staged each spring out of Woolley Park in Panacea. The contest is held in three divisions — Youth, Kayak and Recreation — in both inshore and offshore species categories. For people who prefer being in the water to being on the water, Wakulla County offers good scalloping, especially in years with relatively low rainfall amounts in the spring, a condition that results in bumper crops. Scallop seekers gear up with masks, snorkels and fins and pursue their quarry in 3 to 6 feet of water. Adrenaline junkies may be thrilled to know that Wakulla County is a center of cave diving. Steve Cushman, a native Texan who is no doubt familiar with superlatives, says Wakulla County can legitimately call itself the “Cave Capital of Florida” and maybe the world. Cushman owns Cave Connections, a Crawfordville dive shop and guide service that offers training in scuba specialties including cave diving. Wakulla County and the surrounding area, he said, offer cave-diving experiences in shallow water, deep water and some even in saltwater. He and his customers frequent a collection of caves with an interesting assortment of place names: Clear Cut, Greyhound, Hatchet, Meeting House, Harvey’s Cave, Emerald Sink, Ferrell, Church Sink, Little Dismal and more. “People say that they could never do cave diving because they are too claustrophobic,” Cushman said, “but narrow passageways are comforting.” That is, surrounded by walls, a diver easily remains oriented as to up, down, forward and backward. The cave diver encounters aquatic life that is specially adapted to life in darkness and species whose evolution seems to have been arrested tens of millions of years ago. “We see lots of crawfish that are blind, white and translucent,” Cushman said. Cushman said about 35 percent of his customers are women and he expects that within 10 years, that percentage may reach 50. He has been visited by divers from Russia, Poland, Korea, Japan, South Korea, Great Britain and other far-flung places. Students are trained to handle a variety of scenarios, what to do in the case of a broken fin, for example. Cushman hopes that officials one day will allow open water recreational diving at Wakulla Springs State Park. He would support taking steps to discourage or prevent divers who lack cave-diving certifications from leaving open water. “People would come from all over to get certified at the state park,” Cushman said. “And, meanwhile, they would stay at the lodge for three or four days. “It could be the salvation of that lodge,” he said, noting that a series of managers have tried to make it profitable without much success. As for the hiking excursions, their distances and strenuousness vary, depending on the participants’ physical conditions and stamina. To her, ecotourism remains a largely untapped market. Even so, Wakulla County is already reaping economic benefits from ecotourism, said Bob Ballard, executive director of the Wakulla Environmental Institute (WEI), a Tallahassee Community College facility that offers various programs to spur green, sustainable job-creating industries. Ballard cites as an example the WEI’s aquaculture oyster program, which has about 70 oyster leases along Wakulla’s coastline. “And the reason is our cages hide little shrimps, crabs and whatnots that fish love to eat,” Ballard says. The WEI is seeking approximately $13 million in Triumph Gulf Coast funding (BP oil spill settlement money) to build an oyster hatchery and an oyster processing center to include two lines. One line, explained Ballard, will freeze oysters cryogenically, giving the product a two-year shelf life. The second line, he explained, will pasteurize oysters, ridding them of bacteria and viruses that can cause illness. Ballard said Triumph Gulf Coast board members told him that the oyster hatchery/processing plant is an example of precisely the kind of activity they are looking to fund. The facility, if funded, will be built on Dickinson Bay in Panacea. Already, WEI’s pioneering oyster aquaculture work has resulted in the creation of 75 businesses. Ballard is also excited by the St. Mark’s bike trail extension, which brings the trail almost to the WEI’s backdoor. Understandably, it’s all an uphill battle. But bit by bit, Wakulla County is successfully branding itself a natural getaway.